Back in 2014, archaeologists from the German Archaeological Institute discovered the largest stone ever carved by human hands, and the massive ‘artifact’ was judged to be more than 2,000 years old (possibly dating from 27 BC). 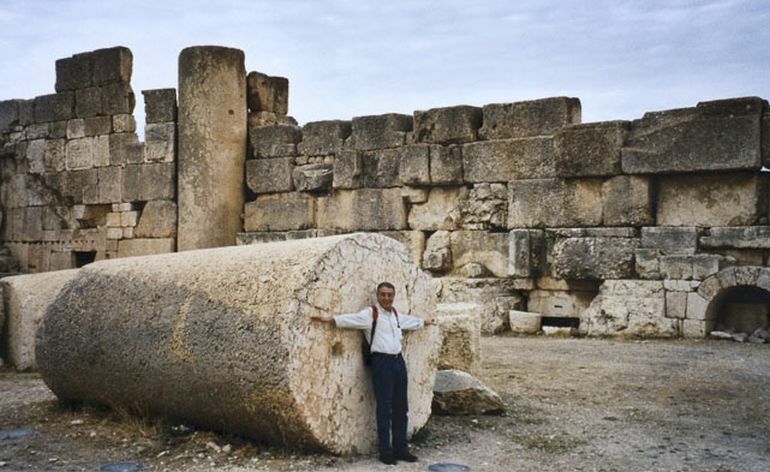 Located inside ancient stone quarry of Baalbek (in Greek and Roman antiquity, the city was named as Heliopolis or ‘Sun City’), the sheer size of this monolith measures 19.6 m (64 ft) in length and 6 m (19.6 ft) in width, while demonstrating a height of 5.5 m (18 ft). This equates to a huge volumetric scope of 647 cubic m or almost 7,000 cubic ft, while accounting for a humongous weight of 1,650 tons! 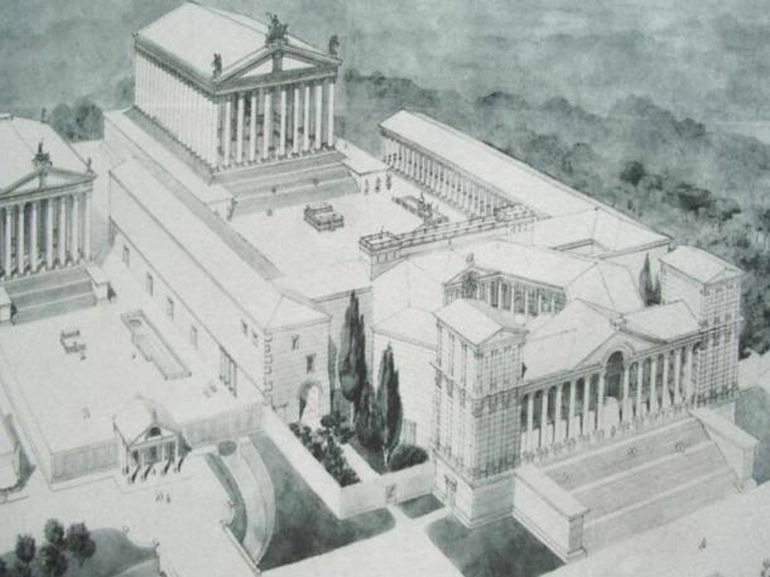 Reconstruction of the Temple of Jupiter. 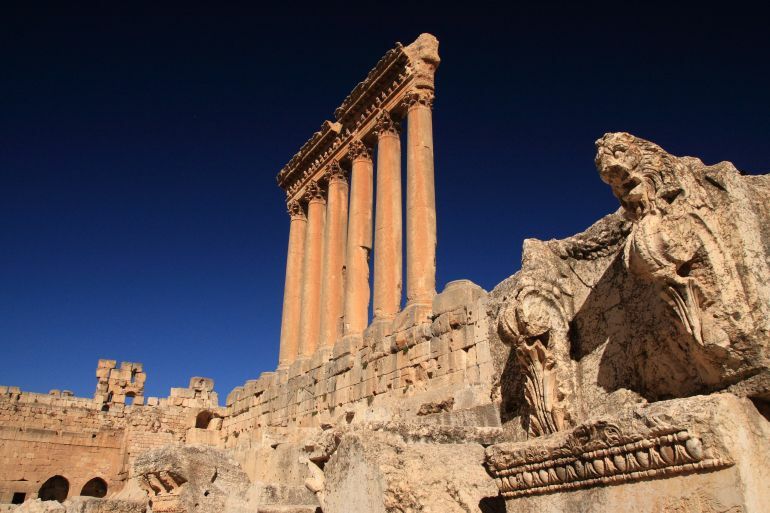 Now historically, Baalbek (or Heliopolis) was known for its massive temple complex dedicated to Jupiter by the early Roman empire era (constructed in mid 1st century and completed by 60 AD). Interestingly enough, during the earlier Classical Antiquity, a previous temple dedicated to Baʿal Haddu was ‘combined’ with the worship of the Greek sun god Helios. This temple was then further conflated with the Greek and Roman sky god named as ‘Heliopolitan Zeus‘ – who was later denoted as Jupiter. The aforementioned temple complex was probably built upon the very foundations of this ancient structure with syncretic gods. The ancient quarry of limestone lies only a little distance (around 800 m) away from the grand temple sanctuary of Jupiter, and as such also boasts of other super-heavy monolithic stone blocks. These includes a 1,240-ton specimen and another 1,000-ton specimen known as the Hajjar al-Hibla (or the Stone of the Pregnant Woman) – pictured in the top featured image. 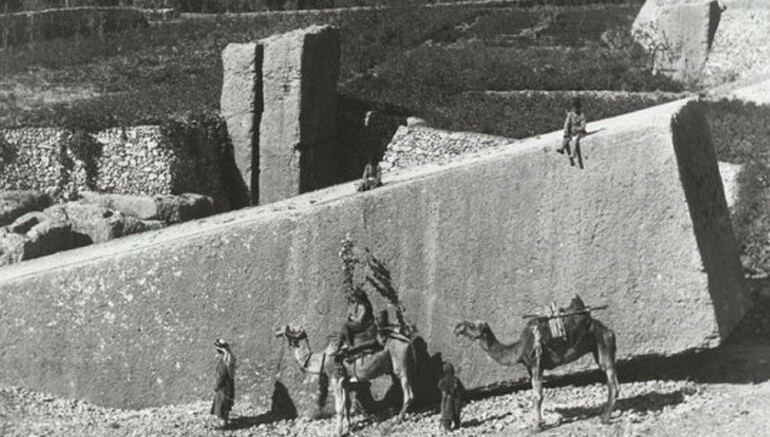 The largest hand-carved stone block in question here was actually found underneath the Hajjar al-Hibla. According to the archaeologists, the inherent smoothness of the block’s surface alludes to the probable scenario where the block was meant to be transported to the temple’s site without any further hewing or cutting. The largest stone block lies to the right of the pronounced block in the image. In that regard, the impressive remains of the Temple of Jupiter still flaunts its massive bearing, with a grandiose arrangement of six columns and gargantuan stone blocks still being arrayed at its base. As a mater of fact, three of these 27 huge stones weigh over 1,000 tons each, and were sourced from the proximate limestone quarry. Intriguingly enough, researchers and scholars are still baffled by the very scale of this construction. To that end, it remains a mystery relating to how the humongous monolithic blocks were hauled and precisely set up along the temple parameter. 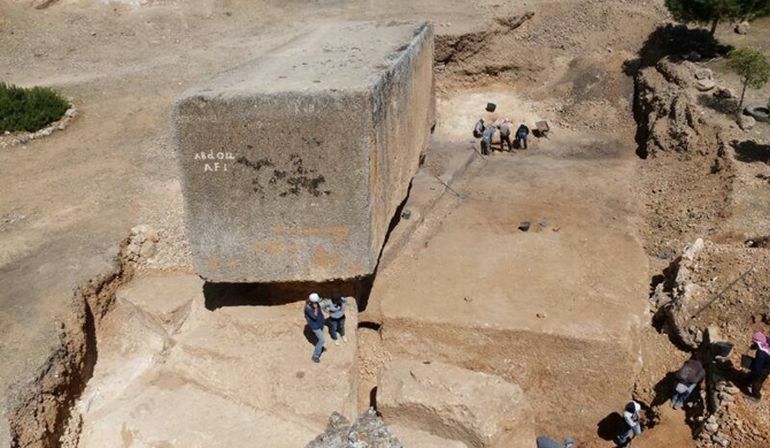 As for the largest stone block from antiquity, suffice it to say, it was never actually moved from its initial position in the quarry. The researchers have hypothesized that the decision to not use the monolith was possibly because of some unsuitability issues (like cracking). For example, even the accompanying Hajjar al-Hibla was ultimately dismissed from usage in the sanctuary because of the inferior structural facade along one of its edge. Aptly showcasing the ‘scale’ of the Roman temple. Now lastly, if we take the rather ‘sensational’ route, a few scholars have rejected the idea that the quarry was Roman in origin. Much of their antithetical theory (that connects the massive stones with an older civilization) comes from the apparently varied style and appearances of these stones used in the Temple of Jupiter. In any case, there is no doubt about the perplexing nature of the entire sanctuary, given its ‘penchant’ for gargantuan scales. Still standing array of columns. 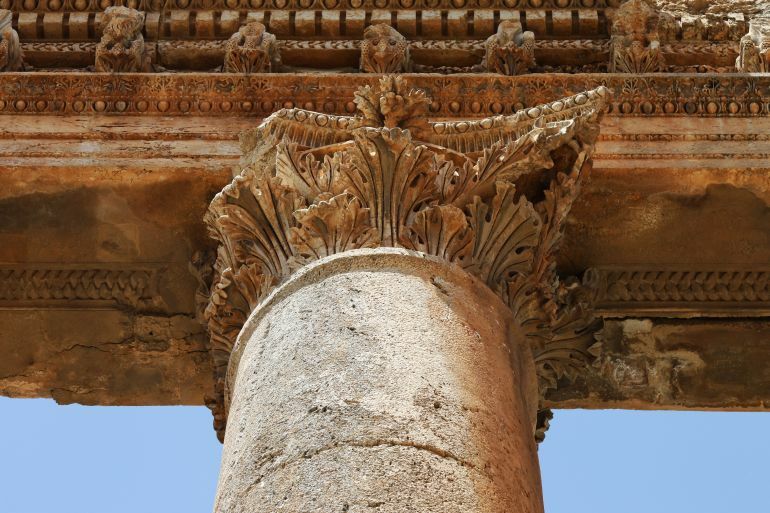 A corinthian capital in the temple of Jupiter, showcasing the intricacy of Roman craftsmanship.